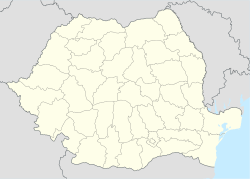 Topraisar is a commune in the Constanța County, Romania. Topraisar and the surrounding areas were the site of fierce fighting in 1916 during two battles of the World War I: the First and Second Battle of Cobadin. Topraysar is of Tatar origin and is rounded out phonetically from Top Rayis Hisar meaning The Fortress of the President of the Union. Top Rayis meaning The Elected Leader of the Union or The President of the Union appears to designate Queen Tomyris and it seems to stand also at the origin of Dobruja and the ancient city of Tomis. Some people believe that the name of the commune derivates from Toprak Hisar meaning Earth/Clay Fortress. At the 2011 census, Topraisar had 4,758 Romanians (92.42%), 3 Roma (0.06%), 17 Turks (0.33%), 359 Tatars (6.97%), 11 others (0.21%). ^ Lahovari, George Ioan; Brătianu, C.I. ; Tocilescu, Grigore G. (1902). Marele dicționar geografic al Romîniei. V. București: Societatea Geografică Romînă. ^ a b Lahovari, George Ioan; Brătianu, C.I. ; Tocilescu, Grigore G. (1901). Marele dicționar geografic al Romîniei. IV. București: Societatea Geografică Romînă. ^ a b c d Murat, Taner (2011). Dicționar tătar crimean-român, Kîrîm Tatarșa-Kazakșa Sózlík. Charleston, SC, USA: CreateSpace. ISBN 9781461083108. ^ Lahovari, George Ioan; Brătianu, C.I. ; Tocilescu, Grigore G. (1898). Marele dicționar geografic al Romîniei. I. București: Societatea Geografică Romînă. ^ Murat, Taner (2012). Opening the Doors of Science. Iaşi: StudIS. pp. 99–104. ISBN 9786066242943. ^ Seslisözlük dictionary, Entry for "toprak"
^ Seslisözlük dictionary, Entry for "hisar"
This page was last edited on 9 January 2018, at 23:25 (UTC).